We built mount #1 on a factory welded fuselage. I knew that it would be a while before the first one sold, and it did this week, more than a year after we built it. Vern and I took the time to make a very heavy duty fixture off the mount before we sent it out. 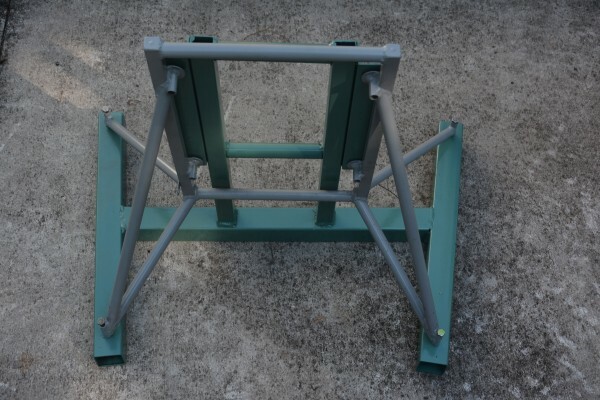 In the picture below, the mount is powder coated Haze Gray and the fixture is painted DD Alpine Green. I did a rough mental calculation and figured out between the 2 day trip to GA with the truck and trailer to make the first mount, the materials in it, and the shop time making the fixture, I have about $2,500 in mount #1 and the tooling. We have set the price on these mounts at $549. This is a good indication why most companies in experimental aviation fail: because the ownership are salesmen who can not physically make nor develop the products they wish to sell, thus they have to hire out every task, and they are often unable to tell if they were done correctly. Additionally they are often fixated on revenue, so they could never develop anything and wait a year to sell the first one. If you ever see a guy in a polo shirt at Oshkosh selling planes using financial buzz phrases like “return on investment” I will bet you 100 dollars to a doughnut his operation tanks in 36 months. In our case I am a home builder, a craftsman and an instructor at heart. Yes I sell things, but they are things that we developed and made ourselves. I can afford to work on R&D projects that will yield interesting, but not lucrative results; I can invest hundreds of yearly hours in free teaching; I can deficit spend on projects for months, or even years without having to answer to any investor. When an opportunity to work with a top notch designer like Bob Barrows comes up, my only thought is about what I can learn from the man, not how much money can be made. We are here for the long haul. The Bearhawk LSA is a great plane, and over time I hope a big number of them are Corvair powered. When these builders need mounts, we have the tooling and will gladly produce them. But for today, I am very happy to have #1 head out the door, and to have had a great opportunity to work side by side with Bob. As I handed over the mount at the post office counter I gave it one last look and wondered how many months it would be until I saw it again, at a College or Oshkosh, bolted on the front of the builders plane. -ww. 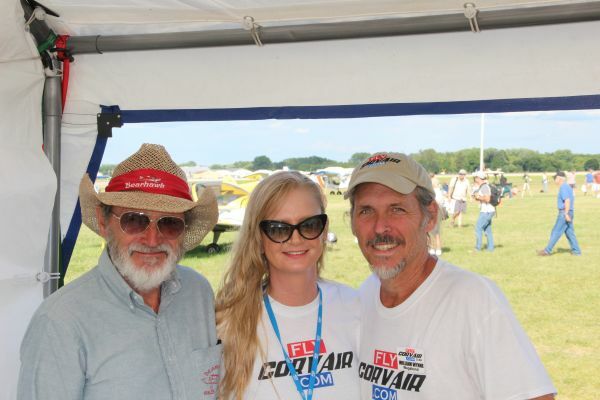 Above, Bob Grace and myself in our tent at Oshkosh 2013. Bob holds the distinction of having flown to every single Oshkosh, all 45 of them. All of his designs have been Continental or Lycoming powered. Opening the option for Corvair power to his LSA builders is a milestone in the Corvair movement. I really like this plane and combination, and have been thinking this may be my next project when my Cleanex is finished. I have my extra Corvair core already ready for the job.